November | 2006 | The S.E.E.P. Bill Maher had some excellent discussion on his 11.17 show featuring guitarist/activist Tom Morello, journalist Dana Priest, actor/professor Richard Dreyfuss as well as Dan Rather and Normal Lear. Richard Dreyfuss is pretty much brilliant in his discussion of Civics and how important reason, debate and other logical concepts are to politics yet are embarrassingly absent in our country. “You can actually learn the constancy of curiosity and the constancy of outrage. You can learn that it is OK to keep asking the questions and to be dissenters. And if you are not taught it, you don’t know it. But we owe ourselves and the United States that we will pass off to our children. To relearn the tools of logic, reason, clarity, dissent, civility, and debate. And those things are the non-partisan basis of democracy and without them you can kiss this thing goodbye. edit – Tom Morello is the the guitarist for Rage Against the Machine, thanks to Gavin from RedGuerilla.info for the correction. 1. A United Nations climate summit, composed of world leaders and bringing together humanity’s best scientific data, has declared once again that the world is heading rapidly towards a state of dire emergency that we may not be able to stop unless major world powers work together in a global cooperation. 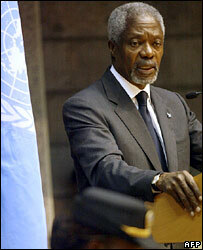 The Secretary-General of the U.N., Kofi Annan, has criticised the global community (read: U.S. government in particular) for a “frightening lack of leadership” on the matter. 2. Sir Nicholas Stern, former Chief Economist and Senior Vice President of the World Bank, now a lead economist for the British government, issued “The Stern Review”, a report compiled for the British government on the economic affects of global warming and what our action or inaction will likely lead to. Basically, if we act now, the cost will only be 1% of the global gross domestic product (GDP) as opposed to a cost of 5% per year losses of the GDP if we do nothing and are reactive to the increasing climate crises as they arise. What do these two things mean? They mean that all of the scientific community has researched and confirmed that global warming and climate change exists and is a threat to human civilization as we know it. In addition, the majority of the world political community including the United Nations has also accepted global warming as fact, recognized the imminent danger and called the global community into action to begin change now. We also now see that economic models based on the projections of the effects of climate change show that the world economy will be severely stressed and show large financial losses with a continuing decline if action is not taken now. We have scientific data, we have the support of the global political and economic community, now we need the support of the U.S. government and it’s people. This is a call to arms that we need to hear. We need to step up and begin recognizing the true necessity of action on global warming and begin to initiate policy and controls that will make a difference now. We need to ignore corporate demands and resistance to policy change and do what is right for our country, our people, the earth and it’s people. An essay by Clint Slaughter, M.D. It is considered irrefutable scientific fact that microevolution exists, ie: species adapt and overcome environmental changes and pressures by taking advantage of random mutation and genetic drift. This is accepted both by supporters of “Intelligent Design” (ID) and the scientific community and is not up for argument. The true issue is that proponents of ID say that microevolution is not sufficient to allow for such drastic changes from ape to man, ie: allowing consciousness and self-realization, no longer eating lice off of each other, wearing proper clothing, and not having such tacky, overdone hairdos. ID states that a higher power played his/her hand to make humans as we are: in his/her image. Alternatively, the general scientific community has, through intense data collection, research, observation, extrapolation, estimation, rumination, and other ‘ations, compiled sufficient evidence to support the theory that microevolution and macroevolution not only exist, but are the driving force that allowed humans to evolve from lower order lifeforms. Both are leaps of faith to an extent; either faith in the scientific method, data collection, facts, and mathematical modeling, or faith in a higher power, a “universal force”, a benevolent, or punishing god. If you can accept the obvious and inarguable difference between the two, the solution becomes simple. The logic and reasoning that supports faith in the scientific method is taught in science class. The lessons of religious texts, spirituality and faith in creation is taught in religion class. The people who feel that ID should be taught in our public school systems need to recognize one simple fact: Intelligent design is not science. You can argue that biological mechanisms such as the eye or our immune systems are too complicated to have evolved due to mutation and environmental pressures alone, but the fact remains that there is no scientific evidence available to support this. You can also argue that ID is a theory, like evolution, that fills in the “gaps” in the fossil record and should be taught as an “alternative”. This is flawed logic in that although it is true that this is a theory, it is purely a religious theory and not a scientific theory in any way, shape or form and cannot be tested by scientific method. Using this logical progression, the concept of intelligent design cannot be considered scientific theory and therefore must be not be taught in our public schools as science. If you still think that ID and your religion should be preferentially taught to your children in school, you do have plenty of options. Outside of public schools, you can take your child to church where creationism is taught and both you and your clergy can resolve the differences between religion and real science by having discussions with your children. If you teach them to have more faith in religion than science, they will believe in creationism, if they find that they see truth in mathematics, observational data, the laws of physics and scientific method, they wil l believe in evolution. Alternatively, you can home school your child or send them to a private school that teaches these concepts as part of the curriculum. You can also move to a country or found your own country where your religion controls a theocracy or monarchy and pass all the laws your particular religious text tells you to. Public schools in the United States of America, however, should be unbiased and equally represent all knowledge possible: history, mathematics, social studies, science, language, literature, philosophy, and yes, religion. America is founded on freedom: freedom of speech, freedom of religion, freedom of thought, life, liberty and the pursuit of happiness. You can still teach your children about the lessons, history, and spirituality of the Bible, the Koran, the Torah, etc., but this is not what should be taught by one of the most advanced educational system in the world. America has the best schools, the best research, some of the most important and innovative advancements of the 20th century and needs to teach our citizens an unbiased, nondenominational representation of world knowledge. 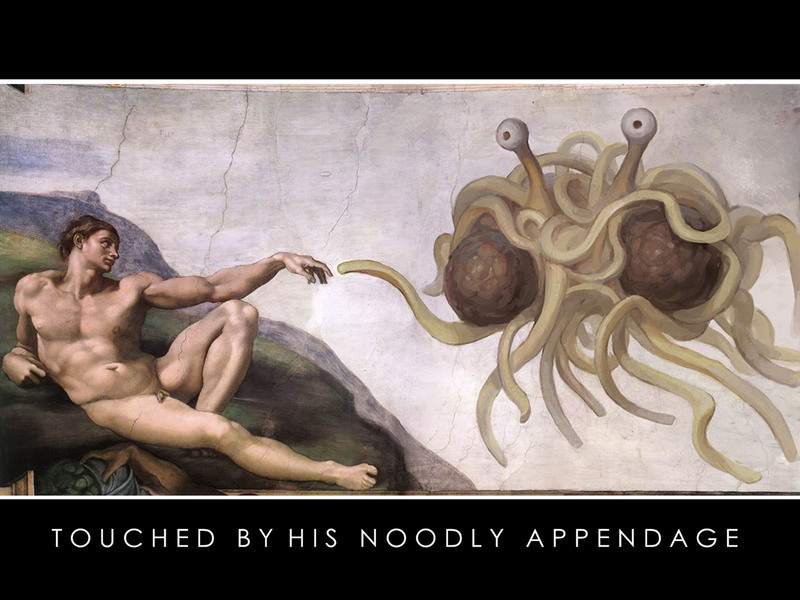 All hail the Flying Spaghetti Monster and his noodly benevolence. Well, looking at the results from the elections yesterday, it seems that we’ve done well to oust Republicans from control of the House and probably the Senate. Hopefully this well incite some change in direction for our country. We have, however, failed to initiate one of the most important steps that we could have made towards solutions and change for global warming. By defeating Proposition 87, California voters have made the statement that the potential for small changes in their gas prices is more important than saving the planet from certain environmental catastrophe. California voters have chosen larger, less efficient cars, they have chosen to bless the oil companies with larger profits, they have chosen polluting coal-fired power plants over clean options such as wind and solar. The majority of California voters have chosen selfishness over the greater good. How utterly depressing. Despite thousands of our troops already dying in Iraq for a war partially motivated by our oil consumption, we Californians have spoken: Give the oil companies have more money! We will consume the product that you take from our grounds and waters for free and fill your coffers no matter what the cost to the planet and society, as long as that cost isn’t directly from our wallets. Like it or not, that is what we have stated by our votes or lack of voting. My only hope is that with more education, effort, and time, the people of our country will choose to make a few personal sacrifices in the name of what is right and what is good for humanity. Hopefully it won’t take another eye-opening environmental catastrophe like Katrina, another tsunami or the like to convince people. At the rate we’re going though, unless we start passing legislation like Prop 87, we will be too late to reverse what we have done and see an environmental and economic upheaval the likes of which the world has never seen. I encourage everyone to educate themselves using unbiased, scientific data on the state of our climate crisis, do not allow yourselves to be emotionally swayed by corporate fear tactics and make solid, logical decisions for our future. To continue my support of certain ballot initiatives up for voting in 2 days, I strongly urge everyone to vote yes on Prop 87. 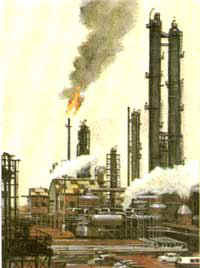 Prop 87 institutes a tax that oil companies must pay on the oil that they extract from the California ground and coastal waters. The 4 billion dollars generated from this will fund a variety of alternative energy programs, thereby increasing the efficiency and production of solar, wind, and biofuels that will decrease our dependence on fossil fuels and foreign oil. Oil companies have spent hundreds of thousands of dollars to stop Prop 87, yet they already pay the very same taxes in other oil producing states like Alaska and Texas. We Californians have been giving oil companies a free ride for years, allowing them to devastate our lands and oceans to pull out precious natural resources for nothing. Will the price of gas go up? Not much – this tax will barely affect the oil companies, plus most of the worldwide oil pricing is set by OPEC, the largely middle-eastern oil cartel. The price of gasoline here is amazingly cheap compared to the whole of Europe and every other civilized country. We pay for this cheap gas with political deals, power plays, and yes, whether you want to believe it or not, the war in Iraq. Prices should be higher and the money needs to go towards finding solutions for stopping global warming and finding new, cleaner ways to power our homes, our vehicles, our schools and hospitals without leaving a legacy of environmental devastation for our children and grandchildren. We desparately need our government to invest money in alternative energy resource and development, and making oil companies pay taxes on what they take from our land is a great start. Vote Yes on Prop 86! I am writing to solicit support for Prop 86 which will increase the current tax on a pack of cigarettes from $ 0.87 to $2.60. The revenue will go towards a variety of actions: healthcare for children, reimbursement to hospitals for smoking-related illlness, anti-smoking campaigns, and other initiatives. As an ER physician, there is no doubt in my mind that this is a good idea. Advertisments have been run stating that physicians and law enforcement officers are against this proposition. I can’t speak for law enforcement officers, but the physicians that are against it are either in the tobacco companies’ pockets, or they are not the ones taking care of smoking related illness on the front lines. There is an increasing number of patients that are on public assistance programs for healthcare, including county funded programs, Medi-Cal (MedicAid), or those over 65 on Medi-Care. These are tax-payer funded programs for people who cannot afford private healthcare insurance for whatever reason. On a daily basis, in the ER we see patients on Medi-Cal and Medi-Care that smoke anywhere from 1/2-3 packs a day, costing $120/month or more, where at the same time, private health coverage starts at around $70/month! In addition, smoking is the NUMBER ONE risk factor for cardiac disease and heart attacks, and causes the vast majority of cases of emphysema and COPD (chronic obstructive pulmonary disease). These healthcare problems alone cost our healthcare system millions of dollars per year, much of which could be saved if we can decrease smoking in the community. Prop 86 not only makes smoking harder to afford, but it individually taxes those people who are buying cigarettes with the money going to pay for their healthcare problems derived from the habit. It makes perfect sense. Here is a link to information about both sides of the argument on EasyVoter so you can make an informed, educated choice. Vote yes for Prop 86!